After strengthening the support near the $79.40 USD, Litecoin crossed the key resistance at $84.50 to move into the bullish region. NEO continues to be bearish with critical support at $32.00 USD. Hourly MACD: Placed slightly in the Buy region. 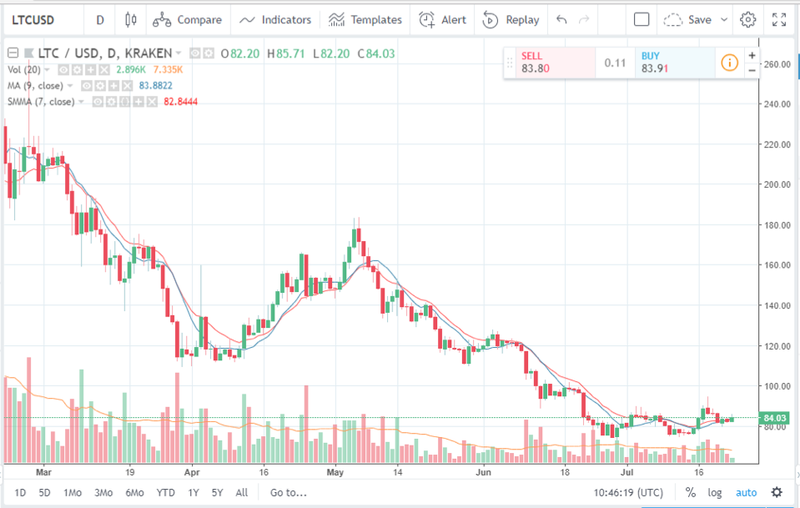 Last week, Litecoin (LTC) had experienced a sharp decline, moving below $90.00 against the US dollar. At one point, the price had gone below the $80.00 level. To prevent a further slide in the price, buying pressure had developed near the $79.50 level and the price action found an uptrend. The price action also experienced a move above the 23.6% Fibonacci retracement level of the $94.55 high to $79.31 low decline. Since today morning, the LTC/USD pair had marked a recovery by trading above $82.00. 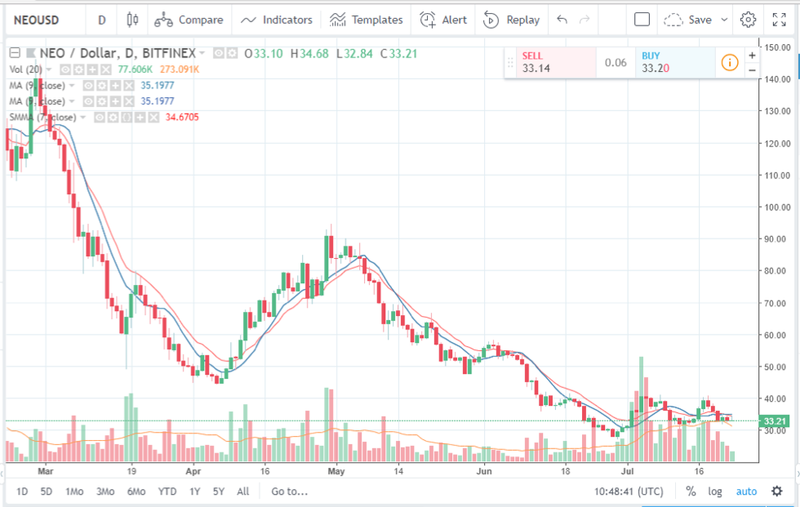 At the time of writing, as the chart shows, the price of Litecoin (LTC) is $84.03 against the US dollar. (As of 23rd July 2018) At the moment the price is placed slightly above the 100-hour simple moving average. The moving average (blue line) marks at 83.8892 currently. Today, till now the high is $85.71 USD for Litecoin so, the next major resistance can be said to be the $87 level. The current moving average and the upward movement of the LTC/USD price shows that there is a chance of the pair continuing the uptrend. So far, as the chart shows, a small green candle has formed. The welcoming news is that the technical analysis from Trading View shows the hourly MACD slightly in the Buy zone. Hourly MACD: Placed slightly in the Sell zone. The NEO/USD pair has been trading red from 18th July 2018 with a small green candle on 21st of the same month. The pair is finding it hard to break the $40.00 resistance line and has currently moved below the $35.00 level. There has hardly been any major upward movement for NEO since 18th July. At the time of writing, the price of NEO (NEO) shows $33.21 against the US dollar and sports a very small green candle. (As of 23rd July 2018) The moving average (blue line) currently marks at 35.1977. At the moment, the crypto coin lies below the 50-DMA. The resistance level at nearly $37.00 is existing since 12th May 2018 and has become quite strong. The NEO/USD pair is thus finding is really hard to settle above the level. The pair needs to move above the $40.00 and settle above it to maintain a strong uptrend. However, if the buyers do not take an interest the price may fall below the $27.00 level. As long as the LTC/USD pair trades above the $84.00 level and the 100 hourly SMA there is a chance of Litecoin continuing the uptrend. As for the NEO/USD pair, it will be a little hard for NEO to move from the current bearish zone. 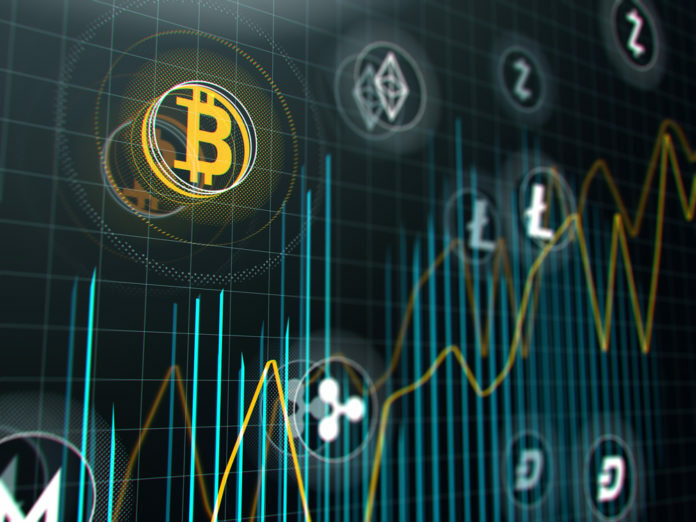 The post Litecoin, NEO Price Analysis: Some Positive Some Negative appeared first on Global Coin Report.